Have had the previous Breville kettle for many years, however due to it leaking I had to replace it. Yes, this is slightly smaller but that is no real worry. Tastes, there are many comments about water having a taste. I have not experienced this but I did wash everything out before use and pre soaked the filter plus ran water through it prior to use, all of this meant no funny tastes at all. Also, if you register the product with Breville they extend the warranty to 2 years. Update – After 3 months the lights just stopped working, in fact threw the trip in my house so something went wrong. 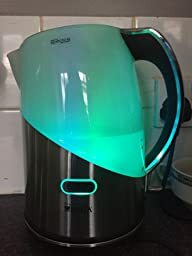 Kettle still boiled water but no lights. Again, Amazon were great and replaced the unit, even posting the replacement out before I had sent the broken one back. Lets hope the second one lasts a little longer!! Update – 27-05-2015, so the lights gave up again, so with that 2 year warranty firmly in place I (see the beginning of the original review)contacted Breville. They are as much use as an ashtray on a motorcycle, stating that in fact they are only supplying a one years warranty and as this is way outside (6 months) that they can offer nothing but a replacement at half price, thieves! 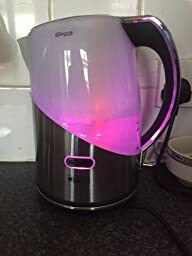 So, have decided to buy a different brand of filter kettle as we should all expect more than 18 months from an electrical item, they say we live in a throw away society but I would gladly keep the kettle if it worked or Breville replaced it and recycled the old one, but no – NOT THEIR PROBLEM. Purchased in Aug and had to send back because the on/off switch would switch off after a few seconds, easy return process and replacement arrived 2 days later. Only problem is that when filling with water you can only add enough water for 2 mugs of tea at a time. 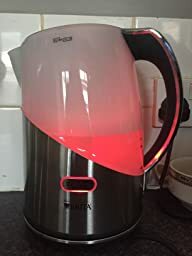 The area where the filter is and you pour the water into is very small (which for the 2 of us is not a problem) and if you want to boil water for 4 mugs (the max) you have to wait for the 1st fill to filter and then fill the kettle again. Very poor and would bug me a lot if we were always having to boil water for 3 or 4 people. 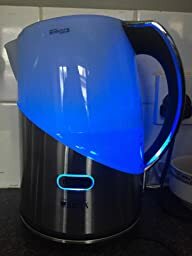 So all in all, its a nice kettle and if you can cope with the cost and only normally need to boil 1 or 2 mugs worth of water then its good. If you normally boil 3 or 4 mugs a time do not buy this model.